WASHINGTON — The House will file a lawsuit challenging President Trump’s declaration of a national emergency at the southwestern border, Speaker Nancy Pelosi announced Thursday, the latest in a series of efforts to stop Mr. Trump from securing money that Congress refused to give him for his promised wall. 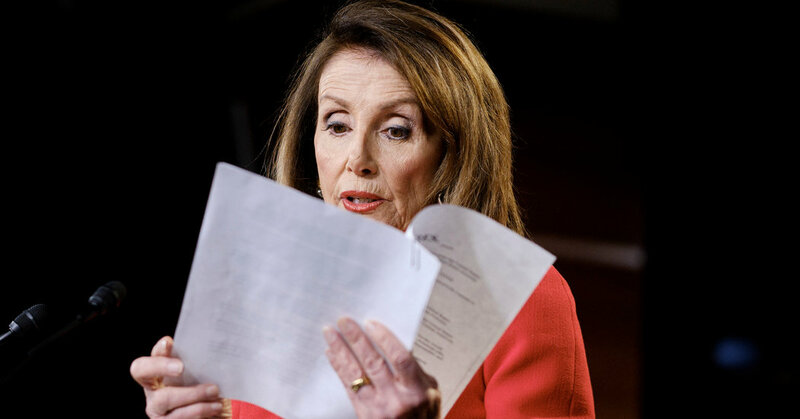 “The president’s action clearly violates the Appropriations Clause by stealing from appropriated funds, an action that was not authorized by constitutional or statutory authority,” Ms. Pelosi said in a statement. The Trump administration has argued that Mr. Trump’s moves to spend more taxpayer dollars on border barriers than Congress had agreed to give him are lawful because he is invoking statutes that granted the president the power to move money around under urgent circumstances. Those statutes placed few limits on a president’s authority to determine that such situations exist. Mr. Trump and his defenders have also noted that presidents have declared national emergencies nearly 60 times since Congress passed the National Emergencies Act in 1976, although critics point out that in no previous such instance did a president invoke extraordinary powers as an end-run around lawmakers after failing to win legislative approval for a proposal. The lawsuit was authorized by the Bipartisan Legal Advisory Group, which consists of the top leaders of both parties in the House: Ms. Pelosi; Representative Steny H. Hoyer of Maryland, the majority leader; Representative James E. Clyburn of South Carolina, the majority whip; Representative Kevin McCarthy of California, the minority leader; and Representative Steve Scalise of Louisiana, the minority whip. The group met briefly on Thursday and voted along party lines to authorize the lawsuit. It is unclear when it will be filed. Legal action has been an option for House lawmakers since Mr. Trump declared a national emergency at the southwestern border in February to activate the power to redirect military construction funds, effectively trying to go around Congress’s refusal to fund a border wall at the level he had demanded. Both chambers passed legislation that would have ended the national emergency, but Mr. Trump vetoed the bill — the first veto of his presidency — and the House could not muster enough votes to override it. On Thursday, a Pentagon spokesman said that final decisions about what military construction projects would have their funds repurposed for his declaration have not yet been made. The House will be joining several other lawsuits already filed. Plaintiffs in another suit challenging Mr. Trump’s border-barrier plans sought on Thursday to expedite obtaining a judicial order to block the government from taking further steps toward building new border barriers — even as administration officials raced to spend what money they had as quickly as they could. The plaintiffs — the Sierra Club and the Southern Border Communities Coalition, which are represented by the American Civil Liberties Union — filed a motion for a preliminary injunction that would bar the administration from building new barriers near Yuma, Ariz., and El Paso until the litigation can be resolved on the merits. Last month, the Trump administration had identified those sectors as locations for new or replacement barrier projects, while redirecting $1 billion in excess military pay and pension funds for that purpose. That part of Mr. Trump’s plans relies not on his high-profile invocation of emergency powers, but on another component that has received less attention: using the Pentagon’s separate authority to redirect some of its annual budget in order to beef up its counternarcotics programs, which in turn can be tapped for blocking smuggling along the border. Because that money must be spent before the fiscal year ends on Sept. 30, the administration is trying to move quickly to issue contracts. That case is pending before a Federal District Court judge in Oakland, Calif., Haywood S. Gilliam Jr., who was appointed in 2014 by President Barack Obama. The plaintiffs have asked him to hold a hearing on the request on May 9.